There are many USB devices out there that don’t adhere to the conventional notions of what these devices should be. What convention dictates should be a flash drive turns out to be a USB powered laptop cooler or – even more bizarre – a USB fan. Well, another unconventional gadget is adding to the breadth of USB products out there. eSupply’s USB Iron should be handy for the tiny wrinkles that start to appear on your clothes as the day gets longer. The eSupply USB Iron is a tiny portable iron that you can carry around in your pocket or a bag and take out whenever there are a couple of wrinkles that need to be taken care of. It’s no bigger than your palm and can be folded into itself, making it even easier to carry around. Its design is similar to that of a thin electric shaver because of its silver color and slim form factor. 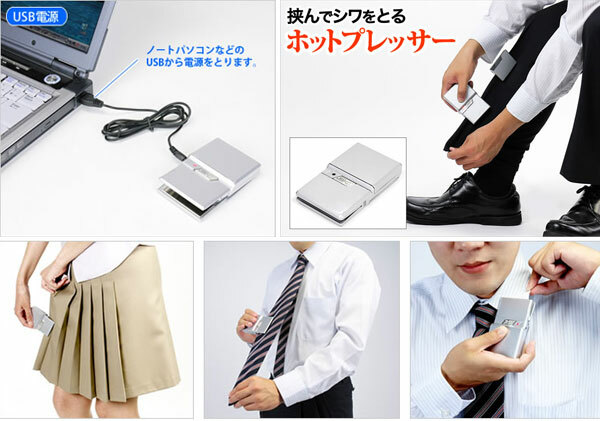 Gathering from the USB Iron’s design and purpose, the Japanese company eSupply knows the value of a quick fix-up before a big meeting, and its USB Iron is a partial answer to that. It won’t be able to iron out a whole wardrobe on the go, but it can definitely take care of stubborn little wrinkles to be seen. eSupply’s USB Iron can be powered in two ways, through a USB 2.0 port or through 3 AA batteries, which are and can be placed (respectively) into the rear part of the iron. The USB iron is able to do its job because of the two heating parts/irons located on the front half. Together, both heating parts form a clamp-like structure in between which the gadget’s user can clip and run a piece of clothing through that happens to be wrinkled. The eSupply USB Iron would make a great addition to the accessory selection of any on the go businessman or travel nomad that needs the occasional tidying up. It’s portable, discreet, and can be powered by two convenient methods. The USB Iron offers a good value, too. In order to become an owner of this gadget, an interested consumer only needs to hand over $10 to eSupply for a unit. The eSupply USB Iron is available through eSupply’s website. It may help to get someone who knows Japanese to order for you; the contents of eSupply’s site are in Japanese. This entry was posted in USB Gadgets and tagged clothes iron, esupply, USB gadgets, usb iron, wacky USB gadgets. Bookmark the permalink.